“Wellness” is not a word you typically associate with the U.S. Army's basic training. 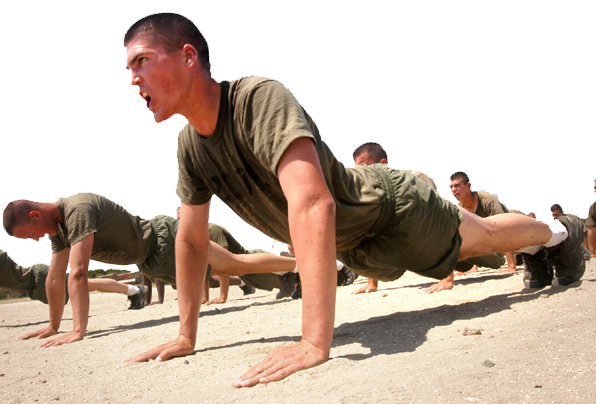 Rather, the term “boot camp” brings to mind images of barking drill sergeants and countless, full press push-ups. But, in a drastic overhaul of the current system, the Army is beginning to accept the current health trends and embrace the idea of wellness as a tactical tool. Major General Richard Stone commented to NPR: “America’s Army is very proud of the fact that we reflect our society. But, since we reflect our society, we also absorb society’s problems.” That’s to say most soldiers show up on Day 1 barely able to run around the block. The updated approach to fitness lays a foundation for the soldiers without injuring them by emphasizing elements of yoga, Pilates, and resistance exercise. Similar shifts are being made in the mess hall. In the past, soldiers chowed down on hamburgers, french fries, pizza, and soda. Now, they can still find comfort foods like eggs, bacon, and gravy, but all of the deep-fried options have been eliminated and replaced with whole grains, yogurt, and fruit. It's a complete dietary reversal. Eventually, basic training ends and soldiers are allowed to make their own choices once again. Although there is no guarantee they will continue their newfound healthy habits, they are at least armed with the knowledge to make good choices. In this same way, companies can encourage employees to make healthier choices beyond the office walls by providing group wellness programs. If an institution as time-honored and rigid as the U.S. Army can embrace wellness, then anyone can. Regardless of the corporate culture, employees should be encouraged to exercise and eat right. Healthier habits lead to healthier employees which cuts back on health costs. Do the math - then drop and give me TEN!